Woo Hoo! It is my turn to host #ProgressiveEats, our virtual version of a progressive dinner party! We are grilling our way to happiness this month, anything and everything on the BBQ! This is such an amazing group of food writers, each one so incredibly talented that I am in awe. Be sure you hop from blog to blog to check out everyone’s posts – just as you would if you were attending a real progressive dinner – and enjoy each spectacular recipe. The links are below the recipe. As the hostess this month, I thought it would be fun to step out of our normal barbecue comfort zones and try something really spectacular – Grilled Prime Rib! Prime rib is our favorite choice for holiday meals, but you don’t have to wait all year to cook it. It can be the perfect way to celebrate a graduation, birthday, job promotion, anniversary, or just because it is the weekend. Cooking it on the BBQ adds a delicate smokiness and perfectly seared exterior. Once you’ve had it straight from the barbecue, you’ll never roast one in the oven again. For a roast this size, I use the same technique that I use for every Thanksgiving turkey – dry brining. If you’ve never tried it, you really need to. No messy liquid brines that are a pain to deal with and figure out how to fit it in the refrigerator! Just rub the outside of the roast with salt (add other herbs or seasonings if you want) and science takes over! Initially the salt with draw a little of the moisture out of the meat, but if you leave it alone, the salt dissolves and the meat reabsorbs the now seasoned liquid, drawing the flavor deep into the interior of the roast. You could add black pepper and rosemary to the salt or try some garlic powder and a little dried porcini powder to really punch up the flavors and add the mysterious and elusive Umami. Add whatever seasonings you want, but don’t reduce the salt – you need it to work its magic! 1 – Choose the best quality roast you can afford. The top classification is Prime and one level down is Choice. If you can’t afford to buy Prime, a Choice roast gives you beautiful flavor and tenderness. 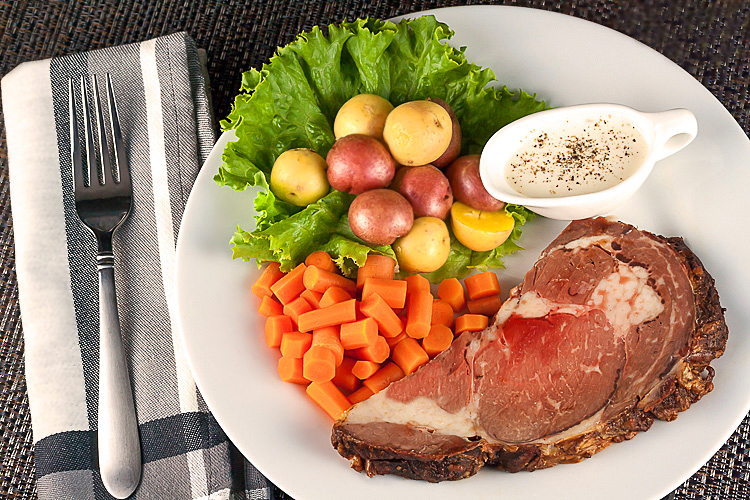 2 – Plan on 2 servings per rib, so a 4-rib roast will serve about 8 people. You can also estimate by weight. For a bone-in roast, buy about 3/4-pound per serving. I always buy a larger roast than I need so we get leftovers for the world’s best roast beef sandwiches the next day! 3 – Dry brine the roast for 24 to 48 hours in the refrigerator. This may sound a little strange, but trust me, it works beautifully and is really simple. Measure 1-1/2 teaspoons of kosher salt per pound into a bowl. For an 8 pound roast you would need 12 teaspoons salt. Rub the salt all over the roast, place it in a bowl or roasting pan, cover with plastic and set in the refrigerator. There is no need to turn the roast, just let the salt do its magic. Slap the roast on the hot grates and walk away to relax while the BBQ does all the work. 🙂 Then all that is left is to let it rest a few minutes while you put the rest of the meal together, slice thick slabs for everyone and serve! And don’t forget to visit the rest of the team’s websites for the rest of the virtual meal! If the butcher hasn't already done this, cut the bones away from the eye of the roast in one piece, then tie them back on with butcher's twine. Make sure they are tied snugly so they don't come apart while you are cooking. I always ask the butcher to do this for me - the bones help insulate the roast from the heat of the grill and act as a natural rack! Note the weight of the roast. Measure out 1-1/2 teaspoons of kosher or fine sea salt per pound. For an 8-lb roast you would need 12 teaspoons salt. If you want to add other seasonings, feel free to mix them in with the salt; be sure to use dried or powdered versions to get more flavor transfer. Place the roast in a bowl or roasting pan. Rub the entire outside of the roast with the salt. Don't worry, this is a very large piece of meat and it will not be too salty. Cover the roast with plastic wrap and refrigerate for at least 4 to 6 hours minimum, preferably 24 to 48 hours. The salt will dissolve in the liquids and then be drawn into the center of the roast, fully seasoning it. After resting, remove from the refrigerator, discard the plastic wrap and pat the roast dry with paper towels. Place on a baking sheet and lightly brush all the surfaces with vegetable oil. Generously sprinkle with pepper. Leave at room temperature about 30 minutes to warm up a little. Meanwhile, preheat your grill on high. Scrape the grates clean. When the grill is around 500°F, turn the burners on one half of the grill to low, creating a 2-zone fire. Place the roast, meat side down, over the hot side of the grill. Using tongs or heatproof gloves to turn the roast, browning it on all sides over the hot part of the grill. When it is browned, place a baking sheet or roasting pan (one that is BBQ safe) over the cooler part of the grill and set the roast, bone-side down on the sheet. Close the lid and lower the heat on the hotter burners to medium. You want to try to keep the temperature around 300°F, adjusting the burners as needed. Let the roast cook undisturbed for 35 minutes. After 45 minutes, spin the baking sheet so the opposite side of the roast is facing the heat. Close the lid again and cook for another 25 to 30 minutes. Use an instant read thermometer inserted into the center of the roast (not touching a bone). This is to get an idea of where your roast's internal temperature is. Start checking the temperature at around 1 hour. Many roasts will reach rare (125°F to 130°F) somewhere around 1 hr 30 min to 1 hr 45 min. If your grill is running hot it will take less time, if the grill is on the cooler side, it will take longer. Each grill is different, the outside air temperature can affect the cooking time, and everyone's roast will be a different weight, so temperature is the best way to gauge doneness. Bring the roast off the heat earlier than you think you should because it will continue to cook even after you take it off the heat. Use a good thermometer and you'll be fine. If you are worried, you can always start it on the grill and finish it in the oven. When the roast is done, remove from the heat and let rest, lightly tented with foil, for 20 to 30 minutes. The internal temperature will continue to rise, adding about 5 degrees to the final temperature, and the juices will migrate back into the center of the meat. Cut and remove the butcher's twine and set the ribs to the side. Use a very sharp knife and cut the eye of the roast into thick slices. Cut between the ribs and serve them as an extra treat. Enjoy! Note: While you can use a charcoal grill with great results, a gas grill will give you much more control. A real classic, great for a family meal! My husband’s favorite is prime rib and I’d love to make this for him the next time we have a family gathering. It looks wonderful, and I think adding the dried porcini powder to the salt is genius. It’s a wonderful shot of umami I use for vegetarian dishes too. And thanks for the detailed information on grilling – very, very helpful!!! What a great idea Jane – I’d never think to grill a whole prime rib. Great idea for a party! Wow, Jane! I have never made a prime rib in my oven, much less on the grill. But yours looks so spectacular that I’m tempted to try this recipe. I can only imagine how delicious it will be. Hats off to you and many thanks for hosting such a fun Progressive Eats. Oh Laura, it is so easy, you really need to give it a try. Set it and forget it, LOL. My pleasure to host such a great team – you are all wonderful! Wow! That looks beautiful. It’s just the perfect thing to cook on a grill and YAY for no messy brines! You are so sweet Anshie, thank you! I love the flavors you get on the grill with both small and large roasts! Perfect grilled beef, Jane! I love dry brining my meats and cannot wait to try your glorious recipe. Bill adores prime rib! Thanks so much for hosting AND for this marvelous theme! !